The spiny forest contains more than just the amazing baobab trees, it was discovered yesterday. The keen-eyed BV Field Scientist, James Von Squirrelburg, came across this amazing specimen whilst out wandering in the forest. Dissenters were quick to write the animal off as some type of squirrel; however, squirrels are not native to Madagascar. A closer inspection suggests something more akin to a red-ruffed lemur, with exaggerated aposematic (warning) tail circumference, possibly an evolutionary social trait due to the lack of protection afforded by the spiny forest. We will be conducting further research on this exciting new species, and hope to have some more pictures for you soon. 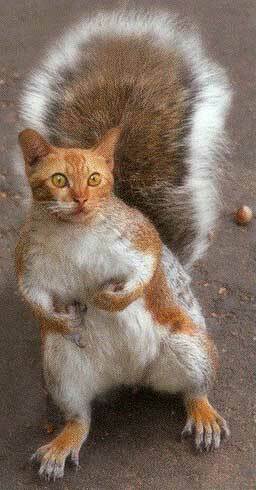 I want to pass on my congratulations to James von Squirrelburg for discovering what I must say is the freakiest looking hybrid species i’ve ever seen – some might say it looks similar to a cat caught in the headlights, or does it act as a passing resemblance to the name sake discoverer? So, my second thought was: it’s not the 1st of April is it? We don’t even have a full halloween moon to account for those piercing eyes either. Or maybe I need my eyes tested.